Transparency Market Research has published a new market research report titled ‘Medical Baby Monitoring Devices Market (Product Type: Video Monitor (Breathing Monitor, Movement Monitor), Audio Monitor (Breathing Monitor, Movement Monitor), Others (Sleep Tracker, Wall Mountable Stand); Connectivity: Wireless, Wired; Hardware: Camera (Room Temperature Sensor Camera, Motion & Sound Detection, Temperature & Motion Detection), Sensors (Under the Mattress, Diaper Attachment, Smart Wearable, Others (Camera Sensing, Non-wearable); Application: Hospital Care, Residential, Nursery) - Global Industry Analysis, Size, Share, Growth, Trends, and Forecast, 2018 – 2026.’ According to the report, the global medical baby monitoring devices market is anticipated to reach US$ 1,577.2 Mn by 2026. The market is expected to expand at a CAGR of 6.0% from 2018 to 2026. Based on product type, the medical baby monitoring devices market has been classified into video monitor (breathing monitor, movement monitor), audio monitor (breathing monitor, movement monitor), and others (sleep tracker, wall mountable stand). Demand for video movement monitors are expected to expand at a faster rate in the near future. Increase in usage of smart baby monitors is projected to boost demand for baby monitors. In addition, rise in number of employed parents and increase in disposable income are key factors projected to fuel the growth of the medical baby monitoring devices market during the forecast period. In terms of connectivity, the medical baby monitoring devices market has been divided into wireless and wired. Due to increase in usage of wireless baby monitors, its market is expected to expand at a CAGR of 6.0% (2018-26). Parents are increasingly using video monitors with wireless connectivity network. This segment accounted for about 85% of the total medical baby monitoring devices market. On the basis of hardware, the baby monitoring devices market has been divided into camera and sensors. Camera is a major hardware used in the global medical baby monitoring devices market. Usage of motion and sound detection cameras will rapidly increase in the near future, because the monitoring can be done even with basic cameras. In terms of application, the market is bifurcated into residential, hospital, and nursery. Residential segment is projected to expand at a CAGR of 6.3% (2018-26) during the forecast period. 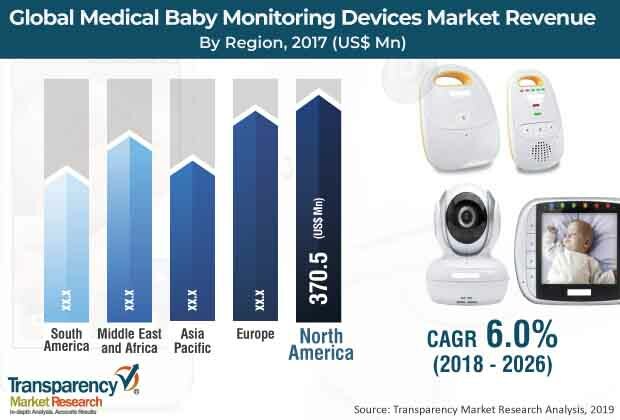 Based on geography, the baby monitoring devices market has been segmented into North America, Europe, Asia Pacific, Middle East & Africa, and South America. Asia Pacific is a dominant region of the medical baby monitoring devices market. The market in the region is projected to expand at a gradual CAGR of 6.8% (2018-26) in terms of value. The market in North America is expected to expand at a considerable CAGR of 5.6% (2018-26), because majority of parents prefer video baby monitors in the baby’s room to keep a track of the baby without being physically present, so that they can continue to do other household chores. According to the report, the market in Europe is projected to expand at a CAGR of 5.7% (2018-26) in terms of revenue in the near future. The market in South America is likely to expand at a CAGR of 5.8% (2018-26).The market in Middle East & Africa is anticipated to expand at a CAGR of 5.7% (2018-26) in terms of value. Some of the prominent players operating in the global medical baby monitoring devices market includes Angelcare Monitors Inc., Dorel Industries Inc., Motorola Solutions Inc., Summer Infant Inc., Koninklijke Philips N.V., Snuza, Hisense, Windeln.De, and Sony Corporation.These players are estimated to face healthy competition in the near future due to presence of a large number of local players in the market. Major brands are likely to focus on research & development to strengthen their foothold in the global medical baby monitoring devices market. Companies are undertaking mergers and acquisitions and joint ventures with local players to expand their product portfolio. Producers in developing countries are focusing on reducing their cost of production and increase profitability for the sustainable growth of their business.